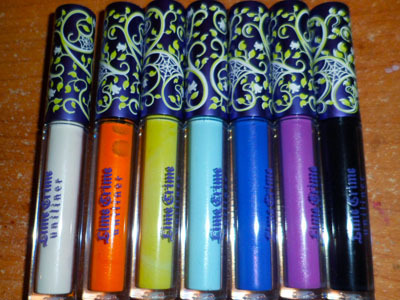 The Makeup Box: Lime Crime Uniliner Swatches and Tips! The team at Lime Crime very kindly sent me a set of their brand-new, uber-bright Uniliners, so I'm swatching them here and throwing in a few tips on application if you happen to like matte, intense liquid liners as much as I do. It's easy to find liquid liners in neutral shades (black, brown, grey, navy), and metallic finishes, but much less common to get hold of them in matte, BRIGHT shades, hence my previous post raving about the colors in this range. These do go on the way they look in images and swatches. I'm actually surprised by just how nice the paler shades are; particularly Blue Milk and Citreuse. They look like they might have a bit of shimmer in the tubes, but go on matte. These come with long-ish, fine brush tips, so you can get maximum intensity (as compared to felt tips which tend to deposit less product. The colors are actually quite wearable in real life despite how bright they look in images. They also don't smear off when rubbed, and don't crack after drying, unless you really coat on layer after layer. They're a good bit smaller than they look in pictures (1.3ml or 0.04 oz as compared to the typical 2ml or so in the average liquid liner). This isn't too much of a problem in the sense that most liquid liners dry out before they're finished, but at $13.99, bear in mind that these are definitely higher-end. The fact that they come with a fine brush also means they might not be the best option for liquid-liner novices or those with shaky hands. Instead of trying to apply your liner in one single stroke, you'll get more control and a more intense line if you apply it in sections. Center, outer, and then inner corners when you have the least amount of liquid left on your brush. 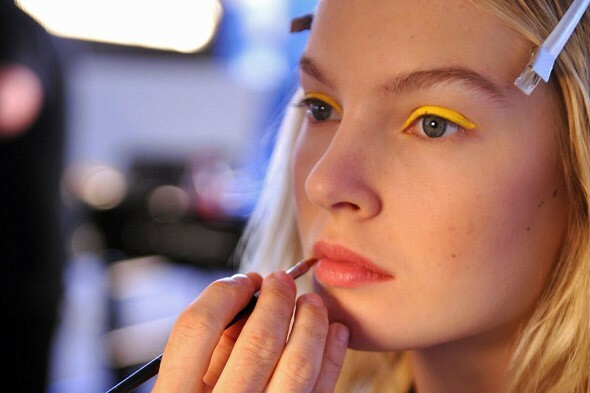 Take care not to apply too many coats of liner or your liner will crease and crack after drying. 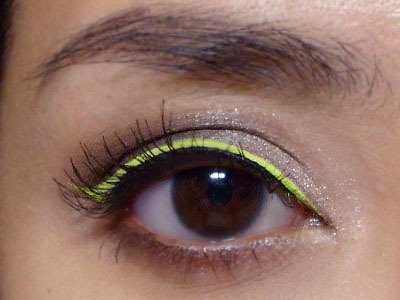 If you're going to do what I do and stack liners (black and lime shown here), apply the paler color first in a thick swatch along or close to your lash line. THEN apply the darker or black shade thinly along the base. Doing it the other way round (black first then colored) would be a whole lot messier and harder to control. Arm yourself with Q-tips and a disposable mascara brush. All that liquid liner that you get on places like your skin and your lashes is going to show up instantly. After applying, clean up any smudges with the the Q-tip or by briskly running the mascara wand through your lashes. 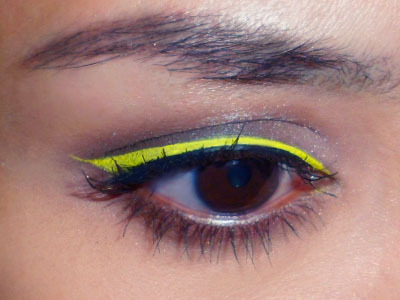 You can wear it neat without shadow, but always add a little dark color around the lashes or wear tons of mascara. Your lash line can disappear otherwise. If you have a very steady hand, wear it along your lower lash line! These, like most liquid liners, are made to last. They won't come off properly with just soap and water. Use a makeup remover. 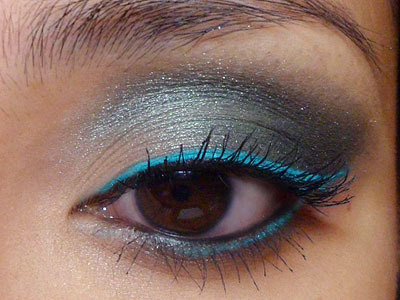 Apply it thick over the entire lid and gently smooth out with your finger tip for a dramatic eye shadow look! Lime Crime products are vegan and cruelty-free. I was utterly disappointed in both price, and size. Nyx has had similar colours in the past and even now has similar colours for a fraction of the price. Hi Nikki, cool! Are those still available? Would love to get hold of some for a comparison but I haven't seen those around.